Whether you are designing a new data centre, trying to fix an issue with an exisiting one, or trying to plan for future IT deployment we can help. But don’t just take our word for it. Why not request a ample report and see for yourself? We specialise in providing quality consulting services to solve existing problems and also to provide advice on future expansions. All our services are based upon the Virtual Facility approach pioneered by Future Facilities. We create a Virtual Facility, which can then be used to either trouble shoot or plan for the future. We also provide reports which can be read by experts and non-experts alike. The report focus’s on the important issues. Issues you may be aware of, and in some cases issues you weren’t aware of. We will describe the underlying sources of any problems, and use graphical pictures and animations to aid in these explanations. We provide real solutions to real problems. We will not provide a 100+page report for the sake of it, full of unnecessary technical explanations to cloud the issues, or cover up for the lack of real content. Also we will not over-utilise colourful pictures which have no substance behind them. Our job is not to make a “pretty” report, but to provide a report which will benefit our customers. The sooner our services are incorporated in the design process the better. As the design project progresses the available options for Facility improvement diminish. So you get the biggest bang for your buck the earlier our services are implemented. Below are some examples of the areas we can help with, which is all well and good. Just about every Facility has a “HOT-SPOT”. The HOT-SPOT isn’t hard to find but if you have one, the following questions are important to be answered. 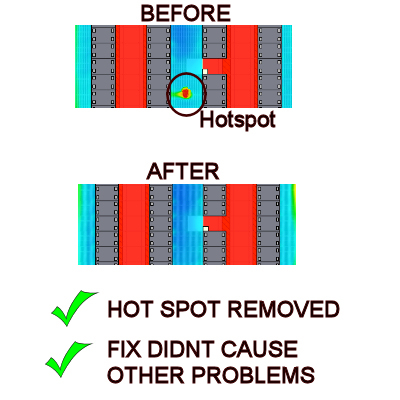 What is causing the HOT-SPOT? The first question is tricky to answer without CFD simulation. With our services, we can answer both questions. We can then simulate a variety of “fixes”. We can assess if they worked and how well. We can then implement the easiest, cheapest solution! Also we may be able to identify other hot-spots in the making and act proactively to stop them before they become a problem. 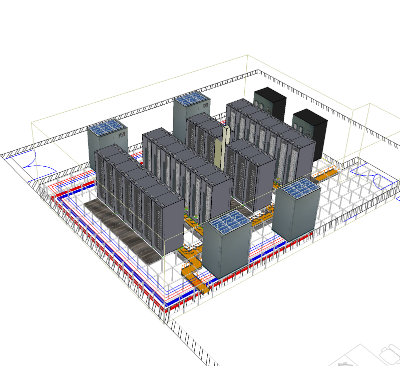 Without CFD simulation, or our services, you will undoubtedly waste time and money!! We always seem to hear the statement “My Facility isn’t actually full, but i cannot add anymore equipment!” This statement usually occurs when there is either a facility-wide or localised mismatch of POWER, SPACE AND COOLING. This could be due to bad design, or down to the fact that the assumptions about future IT equipment to be installed were incorrect. This problem is often exacerbated by the unscientific way in which IT equipment has been installed. Admittedly there are sometimes other considerations (e.g. business group cabinet ownership) but this situation can usually be improved using a CFD simulation of the here-and-now. More importantly if simulation is included in the Change Request process then this headache will undoubtedly diminish. Allowing you to take control of the Facility rather than it controlling you, and you will prolong the lifetime of your Facility. This is discussed in depth in the White Paper “The Elephant in the room is lost capacity”.